Size of this preview: 800 × 461 pixels. Other resolutions: 320 × 184 pixels | 1,072 × 618 pixels. 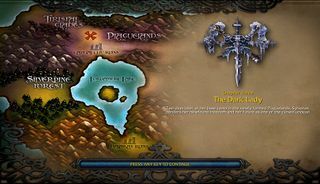 Loading screen for the third mission of the Scourge campaign Legacy of the Damned in Warcraft III: The Frozen Throne, The Dark Lady. This page was last edited on 28 September 2008, at 06:35.